Plenty of us harbor secret wishes or dreams for the future. Maybe it's to finally build that dream house we've been drawing on a napkin for years; or launch a business we've never been brave enough to try; or retire early and travel the world. But Erica Donovan has always had a different kind of dream: To grant someone else's wish, in a big way. And this holiday season, she finally did. The Plainville, Connecticut mom, who works as an independent consultant at the direct sales company Thirty-One Gifts, was awarded a $3,000 Disney gift voucher in September as part of a months-long work incentive program. She was told that the $3,000 could be used towards literally anything in the Disney stratosphere, from a Disney cruise to a stay at Walt Disney World Resorts. But Donovan knew right away where she wanted to spend the money - and it certainly wasn't on herself. "We are a very community-minded family, [so] donating my voucher was the only way to go!" says Donovan, who has also worked as a volunteer firefighter along with her husband, and currently acts as the executive director of a small non-profit that provides services to people with developmental disabilities. It wasn't long before her thoughts turned to the holidays, and the millions of American families in need this year. "We are fortunate enough to have a Naval and Marine reserve base in our town," Donovan tells Babble, "and I've seen the amazing work they do with Toys for Tots. There is need everywhere, and we have so much ... "
Into her cart went stuffed animals of classic Disney characters, Toy Story figurines, and even dress-up clothes - anything she thought would make eyes light up on Christmas morning or Hanukkah night. "The Disney magic I felt from the first call to the store was AMAZING!" shares Donovan, who called the store ahead of time to advise them of her large purchase. 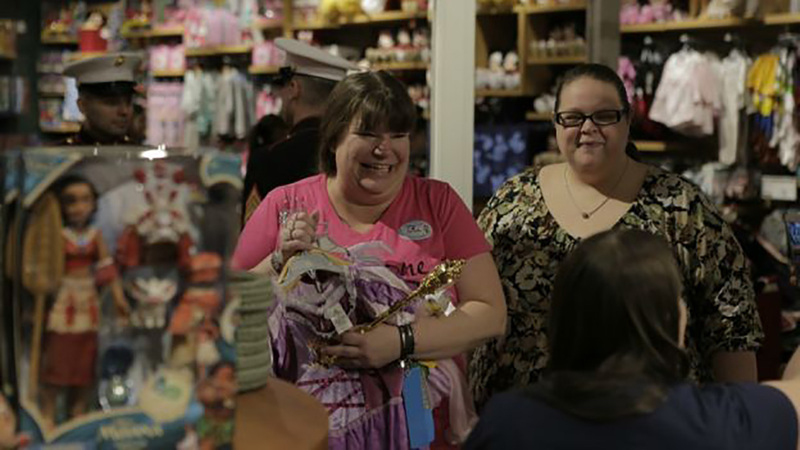 As a result, a dedicated cast member was with her the whole time, helping her pick out toys and making sure she took advantage of the annual Friends & Family discount, which saved her an extra 25 percent. Donovan says the day was filled with an overwhelming amount of joy; so much so, that she had to hold back tears as she updated friends and family via Facebook Live. But what she didn't expect was the chain reaction her random act of kindness would immediately set off around her. "After about an hour," Donovan shares, "[The cast member] quietly let me know that a mother who had been shopping with her children had asked what was going on, and when she found out, had purchased an entire bag of toys to leave with the Marines as her own donation. I'm welling up just [thinking about it], as charity and love are so contagious - this was more than I could have imagined." But that wasn't the only person Donovan inspired to give back that day. "Throughout the day, several other shoppers (and even [a] mall passersby!) found out what was happening and added their own donations of toys to the collection," she shares. "My heart was so full, and I was thrilled that I was able to be the catalyst for so much good." "I've often had the fantasy of passing out hundred-dollar bills to strangers," says Donovan, "and this was my real-life version of that. Knowing that so many children will be receiving magical Christmas toys - and that I was able to provide that - truly IS my wish come true." "When I received the call ... I was literally stunned," says Donovan. "I began sobbing - the ugly, hysterical type of sobbing that renders you unable to breathe or form a sentence - and didn't stop for close to an hour. I was so shocked and surprised, and absolutely touched by the generosity ... Being given the opportunity to actually go back to the store and do the shopping was such an amazing gift to me - and having the opportunity to share it with my daughter and my friends made that reward even sweeter. [It] was the best Christmas gift ever." And that's (still) not all. Once Donovan's own generosity made headlines, other donations started rolling in, too. On December 8 - the same day she headed back to The Disney Store to complete her second purchase - Westfarms Mall added another $3,000 to the pot. And then LEGO joined in with $3,000 more. Even strangers were moved to donate after hearing Donovan's story, which all in all helped her initial act of kindness bring in a whopping total of $13,000 in donations for Toys for Tots - an incredible sum even she can't believe. "It's still sinking in," Donovan tells Babble. "Knowing that my original $3,000 donation has turned into over $13,000 is overwhelming." Donovan says she's also humbled to know that even in some small way, she's helped make Christmas a little bit brighter this year for hundreds of kids whose families are struggling. "There were times when our girls were younger that my husband and I struggled, and I'm so appreciative that we're not in a position now where we need to worry about gifts for our kids," she shares. "Having a personal understanding of the stress, worry, and sleeplessness that come with Christmas for people in need makes me feel even better that so many parents will be able to cross that part off their list." "It's important to me that anyone hearing this incredible story understands that it's not about me," she shares. "It's not about any one person spending money or making grand gestures. It's about spreading love and the spirit of giving. If I can be the catalyst for spreading positivity and joy, even for just a little while during this season, then I've been given the greatest gift possible."